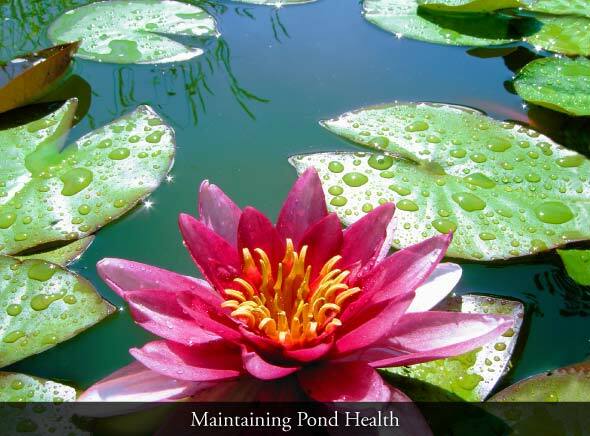 Keeping a pond healthy is not an easy task. The overall health of a pond depends on dozens of factors, including water temperature, pH, nutrient levels, oxygen, and ecological balance, to name a few. When one of these factors is out of balance, the whole pond suffers. Starting off with the right design is key in determining the ultimate success of a pond. Steep, benched (stepped) sides help regulate water temperature and provide a place for plants to grow. Trees near the pond lend shade, but may also drop their leaves into the water. Location is important – a pond in the bottom of a valley will collect run-off and whatever chemicals or excess nutrients that may contain. Wildlife provide another challenge. Ducks can introduce water weeds and will fill ponds up with muck. Racoons and other predators can decimate fish, frog, and turtle populations. It’s best to discourage these creatures from taking up residence in or near a pond. Another important consideration is maintaining a healthy oxygen level. Usually this is accomplished by aerating the pond with a water fountain, waterfall, or aeration device. PO Box 292821, Sacramento, CA 95829. Phone: (916) 381-3400. Fax: (916) 381-3750.